Please, Don't Call Me "Sweetie"
The past several weeks I have been trying to keep my curmudgeon levels to a minimum. It has been a struggle but I am happy to report I have been making fantastic progress. That is until the other day. The Gracious Mistress of the Parsonage and our daughters had planned to spend the day on the town and then have lunch together. That left Yours Truly to fend for myself for the entire day, including lunch. I don't mind this because it is good for the girls to have a day out by themselves. Not only that, but it gives me a break, if you know what I mean. The day began very well for me and I busied myself with getting some projects completed. Before I knew it, lunchtime was upon me and I remembered I was on my own for lunch. A restaurant had recently opened not far from my office and without any further ado; I made plans to go there for my noon repast. I had never been to this restaurant and did not quite know what to expect but it looked like a place for good old-fashioned home cooking. I'm not one that goes much into gourmet cuisine with fancy names I cannot pronounce. I want good old-fashioned food I can recognize at a glance. Plus, I want my plate filled with food. One time I ate at one of those fancy gourmet restaurants. I really didn't know what I was ordering and when the food came there was a big plate with a little bit of food in the middle of it and the rest of the plate was filled with green grass-like thingamajigs. My mama never fed me thingamajigs and I am not about to start eating them now. I have no idea what they are. I walked into this little restaurant and immediately felt at home. I could see by looking around that it was as far away from gourmet cooking as you possibly can get. "Just grab a seat and I'll get to you soon, Sweetie." In my own defense, I must confess I was in the mood for good food and not bantering around name-calling. Being the gentleman I am, I brushed it aside, picked up the menu and began musing about what I was going to order. "Well, Sweetie, can I get you a cup of coffee while you're looking at the menu?" I could feel the curmudgeon level rising as I grunted something resembling yes. I do not go around calling people names, well, usually. I do not appreciate it when somebody, that I don't even know, resorts to calling me names. After all, one man's Sweetie is another man's Sourpuss. I suppose it is better to be a Sweetie than a Sourpuss, but I prefer to make that decision about myself personally. "Here's your coffee, Sweetie. Have you decided what you want to order?" "My name isn't, Sweetie. It's James." "Okay, Sweetie. I'll remember that. Now, what would you like to order?" I gave her my order and set back with my coffee, relieved I had settled that issue and I could feel my curmudgeon levels begin subsiding. It was going to be a nice relaxing lunch, after all. Nothing quite matches up to a relaxing lunch in a good old-fashioned restaurant. I am not exactly a formal kind of a person, but there is a level of informality I do not like to cross before its time. And, in checking my book on gentlemanly manners, I find no place for the name "Sweetie." I just want to set the record straight. As I was finishing my first cup of coffee, I noticed the waitress come zipping around the corner with my lunch items in hand. "Here you are, Sweetie. Just as you ordered." I could feel my curmudgeon levels begin to rise. It is a time like this that a real gentleman rises to the occasion. I am happy to report that I did not strangle the young waitress in front of me. "I told you my name was not, Sweetie." "Yes, I believe you did tell me that." She smiled at me, whirled around and disappeared into the kitchen area. Satisfied that once again I had settled that, I began enjoying the wonderful country repast before me. Ah, nothing like good old-fashioned country cooking. Just as I was finishing up, the waitress came and brought me my bill for the lunch. "Here you go, Sweetie. Take your time and you can pay for it at the counter when you're ready." Before I could correct her for the third time, she whirled around and disappeared back into the kitchen area. I thought to myself, boy, would I love to give her a piece of my mind for dessert. 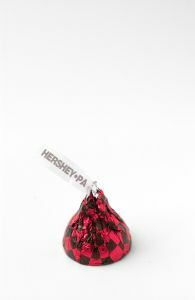 As I was rumbling all of this through my tortured mind, I realized I had several Hershey Kisses in my coat pocket. I keep several handy all the time because you never know when you would like to indulge in a kiss. I pulled one out and then got a fresh napkin and wrote a note on it. "Here's your tip, Sweetie." Then I placed on the napkin a Hershey Kiss. Thankfully God knows my right name." To him the porter openeth; and the sheep hear his voice: and he calleth his own sheep by name, and leadeth them out" (John 10:3 KJV).